Greetings and happy Thursday friends! Have you ever wondered how to get rid of skunk smells? I didn’t until yesterday…. When I got home I tossed the bottle in the recycle bin and came inside. That was when I noticed the awful skunk smell on my left hand! I have NO idea how the scent got on the bottle but it was terrible! And pungent! I tried soap and water, dish detergent, and several different cleaning products. But nothing got rid of the smell. Thank goodness for the Internet! I googled “how to get rid of skunk smells”. Most of the solutions were identical so I decided to give it a try! Mix together and use immediately. Because this recipe uses a whole quart of hydrogen peroxide I decided to mix up a paste instead since I didn’t need that much. I poured about a tablespoon of baking soda in my hand, added a big squirt of dish liquid then added some hydrogen peroxide. It immediately turned foamy, which is good. Using a damp rag, I made it into a thick paste and scrubbed my stinky hand. I did this three times, washing my hands with warm water in between. Guess what? It works! While this is not one of my typical recipes I thought I’d share it in case anyone else should unfortunately need it. (Like me.) I’m just glad we didn’t meet the actual skunk along the way! Lacey would probably mistake it for her new toy and try to play with it. Pretty ironic we just bought her baby skunk the day before for her birthday. 😉 She loves it! There is a commercial dog shampoo called “Nature’s Miracle Skunk Odor Remover” that comes in a 32 ounce bottle for around $4.99. But most people probably don’t happen to have a bottle of this sitting around their house. 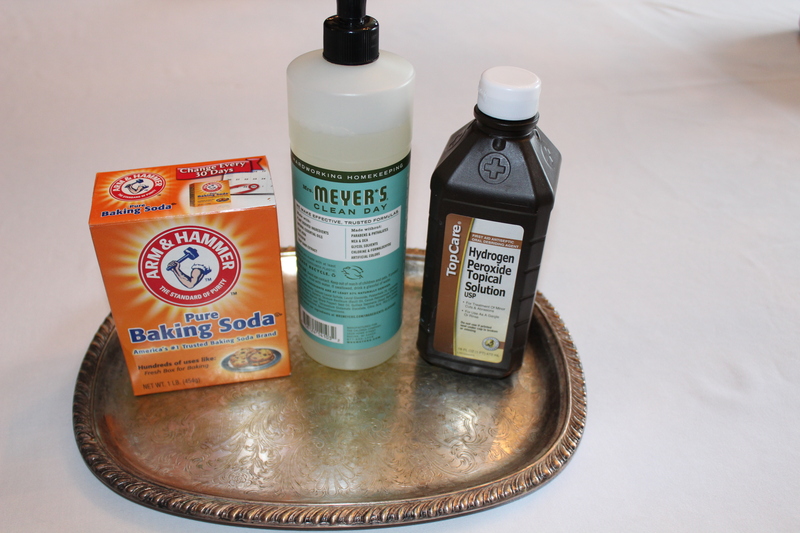 This hydrogen peroxide homemade solution is made with everyday household items and can work in a jiffy. ***NOTE: While this did work for me, please check with your doctor or vet to make sure this is safe for you or your pet. Thanksgiving Dinner Table. A Decorator’s Dream!! Outdoor Spaces at the New Place!